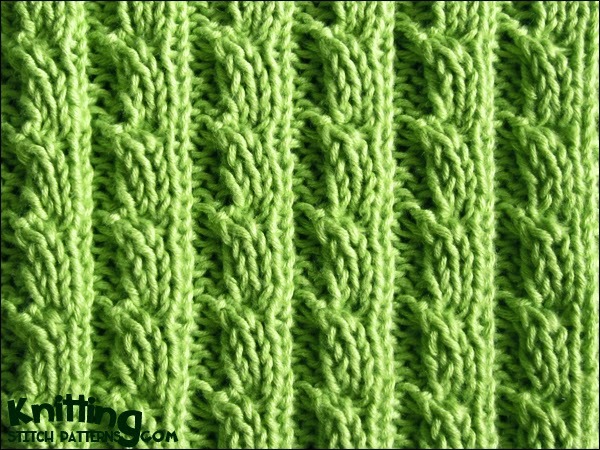 The Ears Of Corn stitch is a six row repeat and is knitted in a multiple of six stitches. Row 1 (Right side): * Knit 3, purl 3; repeat from * to end. Row 2: * Knit 3, purl 3; repeat from * to end. Row 3: * Knit 3, purl 3; repeat from * to end. Row 4: * Knit 3, purl 3; repeat from * to end. Row 5: * Knit 1, slip 2 sts to dpn and hold in front of work, knit 2 sts then purl 2 sts from the dpn, purl 1; repeat from * to end. Row 6: * Knit 3, purl 3; repeat from * to end.